Standard-S-ABK stand is sold separately. 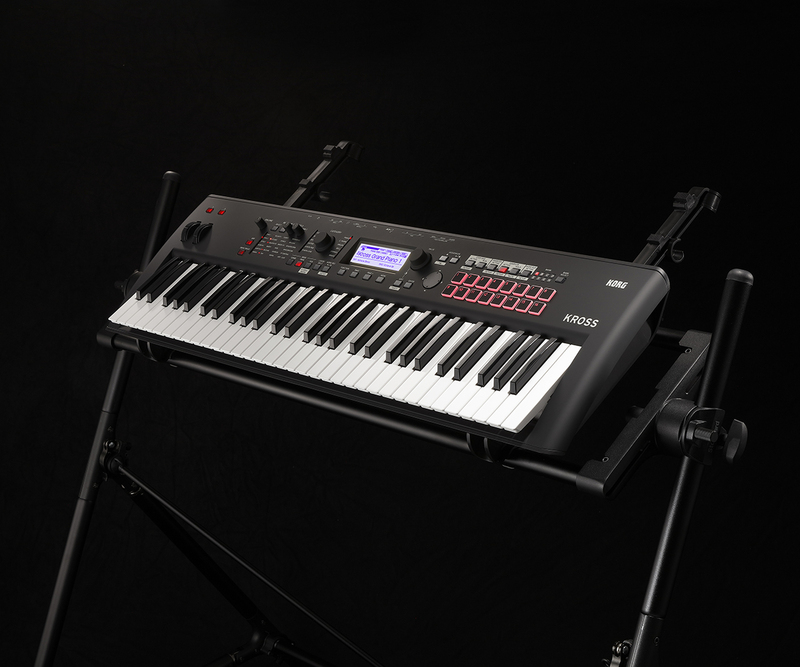 The KORG KROSS 61-key model, popular for its class-beating performance and stylish design, is now joined by new models in a variety of colors. The lightweight body that makes the KROSS so easy to transport is a perfect match for the four new neon colors: green, orange, red, and blue. * All specifications other than color and additional pre-install sounds are identical to the standard model of the KROSS-61. New KROSS 2-61 pure white limited edition. The new pure white panel will further accentuate its stylish and compact body, making it shine and stand out even more on stage! Only a limited number of KROSS 2-61-WH units will be available for sale. 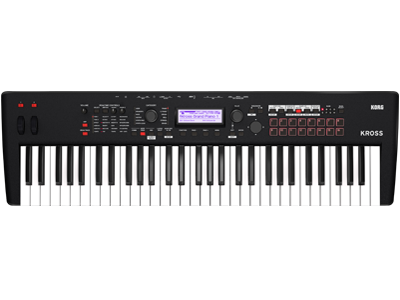 * All specifications other than the color are identical to the KROSS 2 61 keys model. 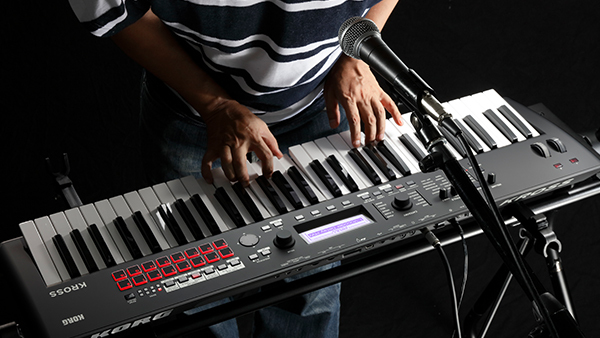 The sound quality of KORG synthesizers is endorsed by top-ranking musicians around the world. The evolved KROSS 2 expands polyphony from 80 to 120 voices, and dramatically powers-up the number of internal programs from 809 to 1,075 programs. Including multi-layered pianos and electric pianos, thick strings and other new sounds that will work well with any band, as well as the latest drum kits to cover current styles such as EDM. The wide selection of programs covers your needs from live performance to studio production. The KROSS 2 now provides 128 MB of built-in expansion PCM memory. By selecting from optional libraries that will be released following KROSS 2, you can expand KROSS 2’s internal sounds to meet the needs of your performing style or situation. The high-quality EDS-i Enhanced Definition Synthesis-integrated sound engine is inherited from KORG’s professional synthesizers. You can use a total of seven effects units simultaneously: five insert and two master. Rich expressive power is available from the selection of 134 high-quality effects, including standard effects such as delay and reverb as well as amp modeling, vintage effect units, and even a vocoder. 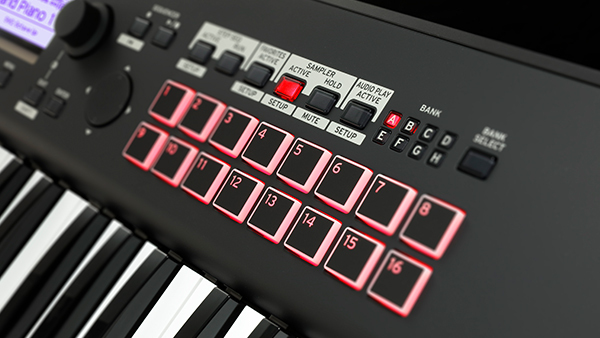 As a first in its class, the KROSS 2 is newly equipped with a unique sampling function that provides 16 playable pads. You can record the input from the LINE IN jack and assign a stereo sample of up to 14 seconds to each pad. Up to four pads can be triggered simultaneously. You can edit the sample waveform using functions such as start/end loop point settings and normalize, and even resample within the KROSS 2, allowing you to perform extensive sampling without requiring any additional equipment. Long audio files from an SD card can also be assigned to these pads. It's easy to get around on KROSS 2, thanks to a user-friendly layout. The panel of the KROSS 2 has been further improved since the first KROSS, ensuring that anyone can quickly access desired sounds and functions from the enormous range of choices. The new realtime control section lets you directly control KROSS 2’s main parameters without having to navigate through a menu hierarchy. 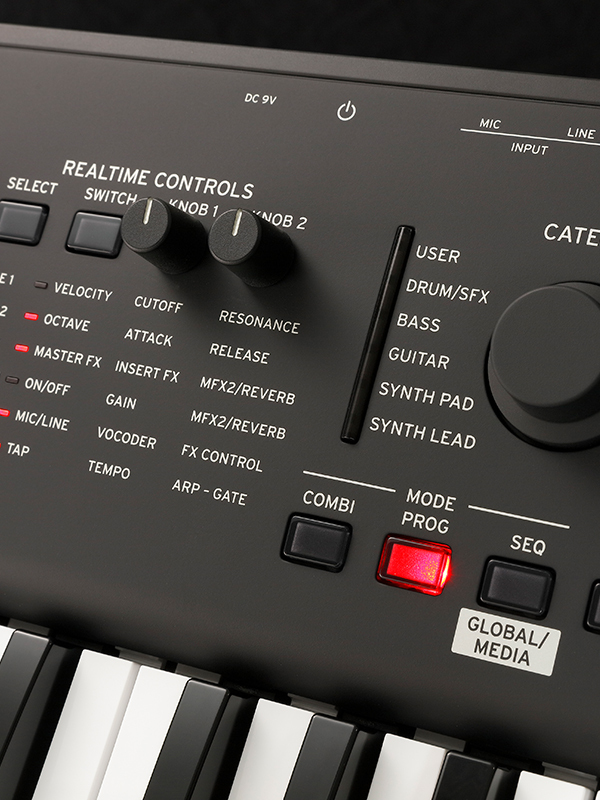 In addition to realtime control of the sounds and effects, and simple editing of programs, you can use the knobs to easily control the vocoder settings or adjust the tempo of the arpeggiator and sequencer. The favorite function lets you register frequently-used programs and combinations and recall them at a single touch, and has even been expanded to allow 128 favorite locations, twice the number of the first generation of KROSS. This function is ideal for live players that need quick access to a specialized set of sounds on stage. The layer/split function, which lets you layer two sounds or assign separate sounds to the left and right regions of the keyboard, is now easier to set up, thanks to a dedicated quick layer/split button. A category dial is provided, allowing you to immediately find the sounds you're looking for amid the vast range of choices. Just choose the general type of sound, such as piano or organ, and then make your selection quickly and efficiently. The amazing mobility of the KROSS series is better than ever. The 61-key model features a new and stylish design, and its weight has been further reduced from the 4.3 kg of the previous model to an even more lightweight 3.8 kg. Additional improvements in power efficiency allow up to seven hours of battery-powered operation from six AA batteries. The 88-key model newly provides an accessory compartment that can hold spare batteries or cables, as well as an easily accessible front-located battery panel. 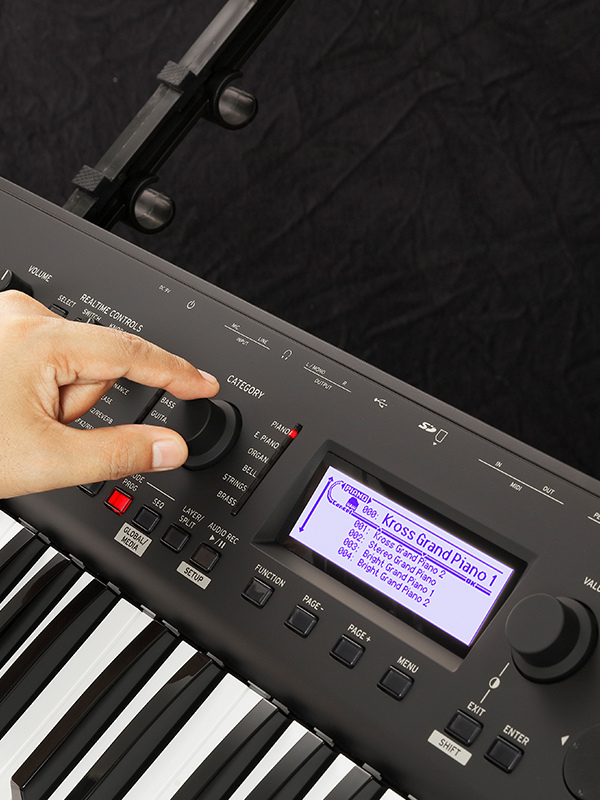 On both models, the rear panel KORG logo is fully illuminated, letting you stand out on stage. The evolved KROSS 2 also features high quality in its body finish. 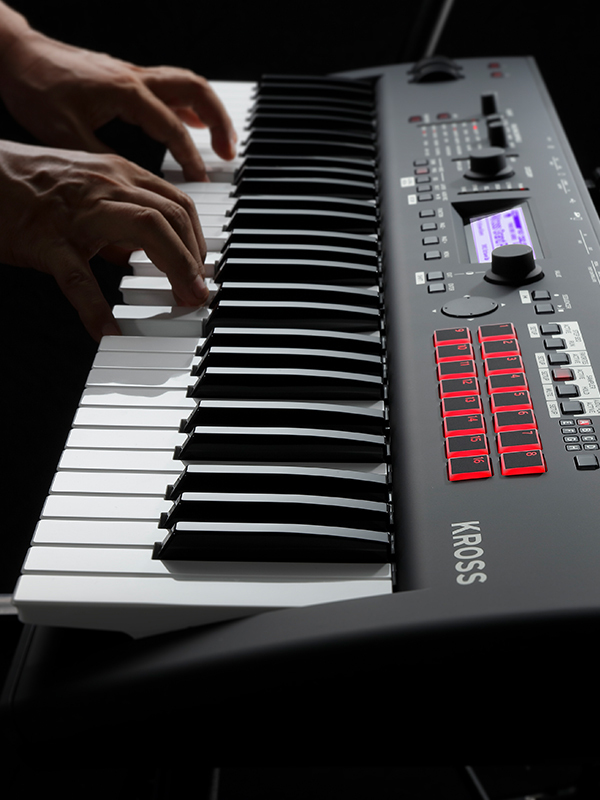 First, the 88-key model uses a stylish and cool “dark blue” color. The 61-key model uses a “super matte black” color with a high-quality rubberized finish that is durable and feels great to the touch. Lavish use of this sophisticated rubberized finish gives the instrument a highly professional appearance. The 61-key model is additionally available in a limited-edition “red marbled” color. The special marbled red finish is unique and different on each KROSS 2 unit. The built-in stereo audio recorder lets you record your KROSS 2 performance, or overdub an external input source such as vocals. There's also a pad audio play function that allows recorded sounds or audio files imported from an external source to be assigned to each of the 16 pads for playback. 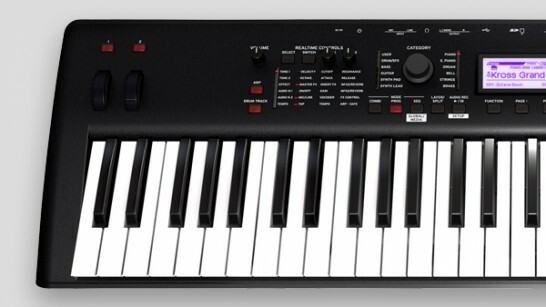 Unlike the sampling function, this allows extended recording and playback that is limited only by the capacity of the SD card; you can strike a pad to play back the backing of an entire song while you perform on the keyboard, or use the pads to trigger sound effects or background music. 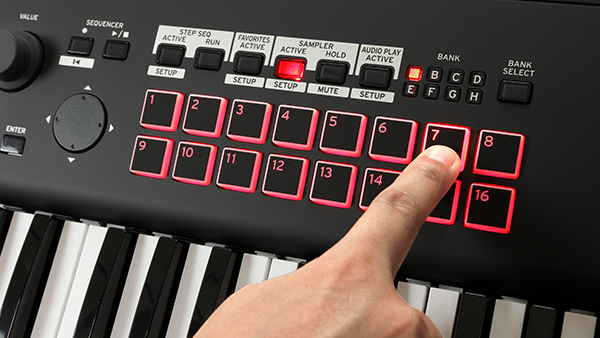 The 16-track MIDI sequencer records your keyboard performance and controller movements as MIDI data. It can also record your pad sampler performance, providing an easy way for you to create sketches of ideas for songs. This lets you use the 16 pads to intuitively and quickly create original rhythm patterns of up to 64 steps. The drum track lets you add rhythm to your performance simply by pressing a button. Choose from 772 preset drum patterns that cover a variety of styles. This function is a great way to generate ideas for songs; simply hold down keys to generate rhythmic chords, bass phrases, or guitar strumming. The 1/4" phone MIC IN jack lets you connect a mic directly, so there's no need for a singer-instrumentalist to provide a separate mixer when performing live. A vocoder function is also built-in, and you can easily perform vocoder sounds with rapid access via the realtime control section. Also provided is a LINE INPUT stereo mini-jack that's convenient for connecting your audio player or for sampling. In addition to USB MIDI interface functionality, USB audio interface functionality has been newly added. 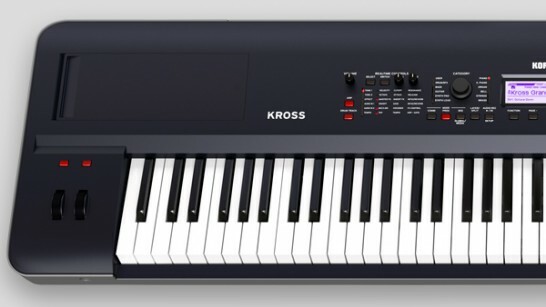 You can connect the KROSS 2 to your Mac or Windows computer and enjoy DAW recording, or easily use the instrument for playing in conjunction with your iPad or iPhone. 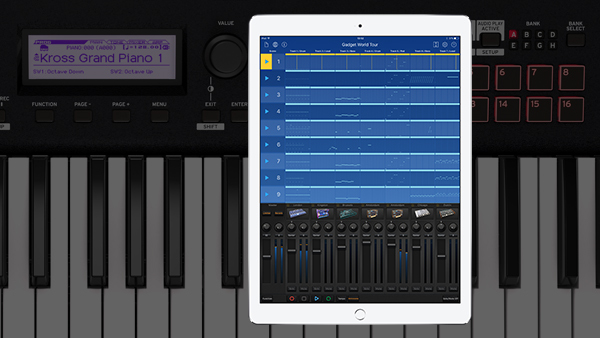 The KORG Module high-quality sound module app can be used as an external sound module that's played from the KROSS 2, or you can perform with the backing of tracks that you created using the KORG Gadget DAW app, all with the ease of connecting a single cable. A dedicated KROSS 2 Editor and Plug-In Editor are also provided. These let you edit while viewing numerous parameters at a glance on your computer, or allow you to use the KROSS 2 as a software synthesizer from within your DAW. *For connection to PC, use the USB cable (sold separately). 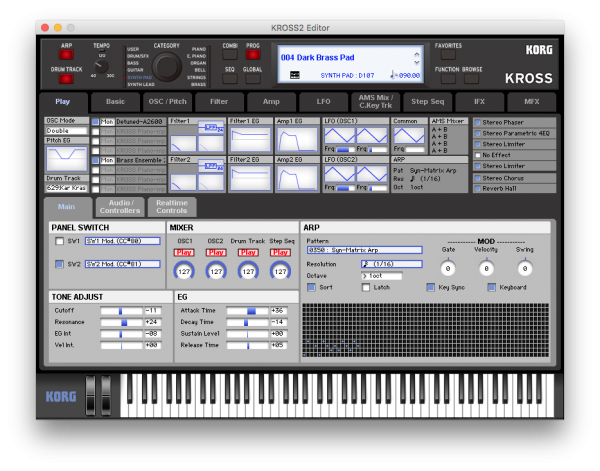 *The KROSS 2 Editor and Plug-In Editor requires KROSS 2 System Version 1.1.0 or later.